Rick L. in Wisconsin recently sent me the following e-mails and photos. 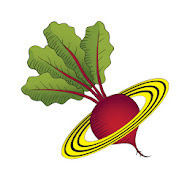 As you might imagine, I'm so pleased to see this kind of feedback on my gardening system. Thank you, Rick, for allowing me to share your comments and photos here. I find them powerfully inspiring, and I'm sure everyone who comes to this page will too! We have emailed back and forth a few times. Last spring I bought your Mini-Beds on Plastic Reports 1 & 2. I also bought Report #3 last week. I have read all three reports more than once. I want to thank you for the mini-bed gardening system. I, like you, resisted using plastic in my gardens until four, or five years ago. I started using the Dewitt fabric with holes burned in it for carrots and onions. It worked pretty good. Your Mini-Beds on Plastic Reports made so much sense and reduced weeding that I went whole hog with it. I have two gardens. My upper garden is near the house. It is about 36’ X 40’ and I grow tomatoes, broccoli, green beans, cabbage, carrots, herbs, cucumbers, zucchini, lettuce and peppers in it. This is the garden I converted to a mini-bed garden. I have 67 beds in this garden. My pole bean cattle panel trellis are the only beds that are not standard 30” X 30” beds. See attached picture. My lower garden is more traditional and is about 30’ X 60’ in size. I grow potatoes, onions, sweet corn, dry beans and garlic. Last summer I planted eight mini-beds of strawberries down there. I converted about one third of this garden to mini-beds for garlic and strawberries. The strawberries did great until the deer got in to them around mid-October. They really munched them down to just the crown and a few sprigs left on each plant. I didn’t know deer liked strawberry plants so much. I don’t know if they will make it through our winter, but I mulched them good, so time will tell. I have to tell you my wife and I were more than pleased and impressed at how the mini-beds performed. We had a few things fail for one reason, or another, but it wasn’t because of the mini-beds. We had the best peppers we have ever grown last year. I put four pepper plants to a bed. Just recently I have read that you should plant peppers so the plant leaves touch when they are mature. Supposedly it increases the yield. I don’t know if that is true, or not, but last year our peppers produced like crazy. 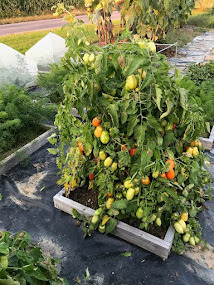 When the frost finally killed them and I pulled the plants, I had some peppers with one inch diameter stems. I’ve never had peppers plants like that before. Maybe it was the weather, maybe it was the mini-beds. Our zucchini, cucumbers produced like crazy and lasted two, or three weeks longer than they usually do. Our tomatoes didn’t do the greatest, but we had plenty to eat fresh and canned enough to get us through the winter. Tri-planted carrots did good. Everything pretty much did better, or a lot better than the traditional row planting and mulching that we used to do and there was a lot less weeding work. That is a major plus to me. We have quack grass here and it seems I’m battling that through out the whole gardening season. Not last year. I didn’t have any quack grass come up in the mini-beds. In the lower garden where I planted strawberries in July, I just had the area covered with plastic and the mini-bed frames pinned down. When I cut the plastic and cracked the soil in the beds, I did find a lot of quack grass rhizomes, but they were dry and appeared dead. They did not grow in the beds. I could go on, and on, but I’m going to stop here. We are looking forward to a great gardening season with our mini-beds. I’ve attached a few pictures of my mini-bed garden from last year. I have many more pictures, but I think these show it the best. How long have I been growing my own food? Well, the short answer would be, 44 years that my wife and I have been active, avid gardeners. My wife and I were married in 1971. I was active duty military at the time. I was discharged in 1975 and we have had a garden every year since. Sometimes not such a great garden, but we always got a fair amount of food out of them. Now our gardens feed us close to year around. When I go grocery shopping it’s mostly for dairy products (milk, yogurt, etc.) and meat. We have chickens, so we have our own eggs. The other answer would be most of my life. My parents and grandparents had gardens as far back as I can remember. While I wasn’t involved very much with planting, or preserving the harvest when I was a child, they got me involved in weeding as soon as they could. Ha! Ha! So I have been eating home grown vegetables most of my life. Now I start my own seeds every year. I marvel at the miracle of a tiny seed growing in to a healthy, vigorous plant and producing food for us to eat. I never thought much about that before I started growing my own plants from seed. I’ve sent a few more photos. Every thing was grown in mini-beds. Hmmm... that's a real nice Whizbang Garden Tote in that last picture (Click Here for how-to instructions). 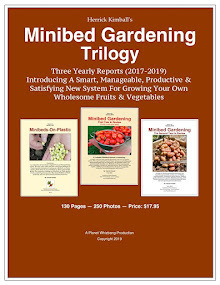 If you are not familiar with my Minibed gardening system, full details are in my 2019 Minibed Gardening Trilogy Report. Click Here to learn more. If you are a gardener, or an aspiring gardener, you're going to like it here. With 130 pages and 250 photos, this Minibed Gardening Trilogy gives you all the how-to information. Billboard Tarps For Minibed Plastic? This is a more affordable option worth serious consideration! Have You Seen My Garden Idea Book?